Geography Graduates: Where are they now? 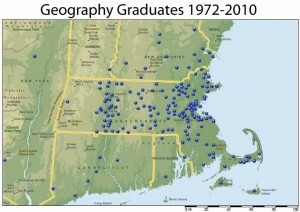 The UMass Geography Program offers two undergraduate degrees (B.A. and B.S. ), a minor in Geography, an undergraduate certificate in GIST, a one-year professional M.S. degree in Geographic Information Science and Technology, and an M.S. degree in Geography. Graduate students can also earn a Ph.D. in Geosciences with a concentration in Geography. 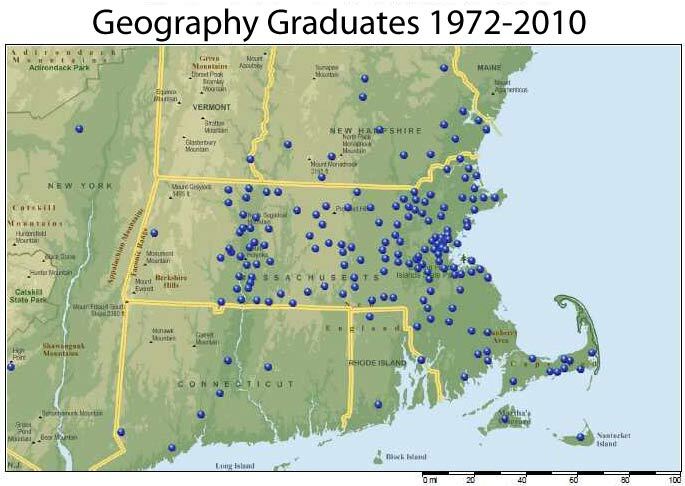 All geography majors complete the UMass Geography Undergraduate Core Curriculum, which emphasizes basic courses in both human and physical geography and skills acquisition in writing, field research, statistics, mapping, and geographic information science and technology. US and world regional studies. Students in the program gain valuable research and career skills in ethnographic fieldwork, landscape analysis, cartography, statistical analysis, remote sensing, and Geographic Information Science. Geographers pursue rewarding careers in education, business, government agencies, and nonprofit organizations. Develop a solid foundation in geographical theory, concepts, and methodology, emphasizing geographic literacy, including spatial patterns and processes involved with worldwide diversity, globalization, and sustainability. Appreciate the diversity and spatial variation of peoples, cultures, identities, and political, economic, social, socio-ecological, and ecological systems and conditions. Understand the historically and geographically complex and dynamic relationships and interactions of people and environment, including socio-ecological systems, current environmental issues and policy debates, and key conservation, development, and sustainability concepts and approaches. Develop a background in a concentration, with choices for BA concentrations in human geography, environment and sustainability, international studies, climate change and society, urban geography, or Geographic Information Science and Technologies (GIST). Would you like to learn more? Click here to make a geography advising appointment. Geography offers students the opportunity to study the dynamics of global and local environmental change and to place their local experience in a global perspective. Physical geography involves studying the physical processes, both natural and anthropogenic, that affect the earth’s surface, atmosphere, and biosphere. The department has strengths in the study of climate, climate change, landforms and land surface processes, remote sensing of the environment, and GIS analysis and applications. BS students in physical geography build on a foundation of math, chemistry, physics, geology, and computer science. The degree begins with the UMass geography core curriculum and adds three advanced physical geography courses and four additional electives. Click here for the Geography BS Degree Requirements. In addition, UMass offers wintersession, evening, summer, and online courses in Geography through the Department of Continuing Education. The program offers Departmental Honors in Geography through Commonwealth College. Each spring, graduate and undergraduate students in Geography are eligible to apply for modest financial support from the Department of Geosciences for summer research activities. UMass Geographers are actively engaged with campus sustainability initiatives. Click here for the UMass Sustainability webpages.